Ascidians (sea squirts) are invertebrate chordates (subphylum Urochordata or Tunicata, class Ascidiacea). Ascidian eggs develop into tadpole larvae thorugh relatively simple manner of development with samll number of constituent cells. The larvae represent basic body plan of chordates, having dorsal neural tube, notochord flanked by bilateral muscle, and brain with two sesory pigment cells. Notochord, a characteristic feature of chordata, is visible in the tail of the larva, consisting exactly 40 cells alighned in a sigle line. The total number of cells of the hatched larva is approximately 3000. The embryogenesis is invariant and cell lineages are well described. 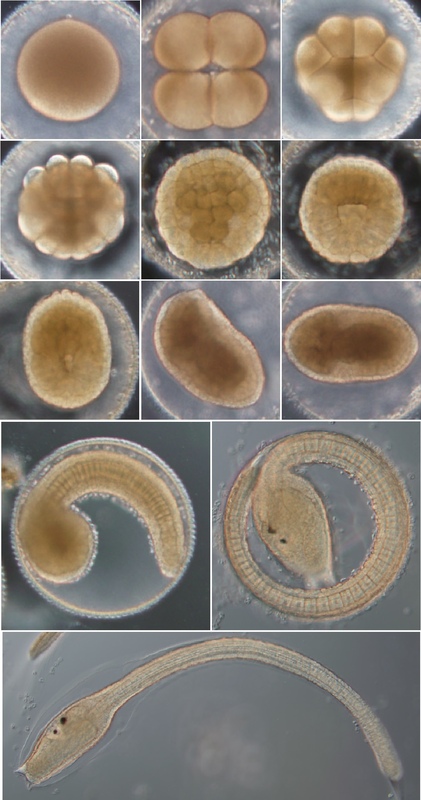 Photos show living Halocynthia roretzi embryos at various stages from fertilized egg to hatched larva (35 hours of development). From the upper left, fertilized egg, 4-cell, 16-cell, 64-cell, 110-cell, gatrula, neural plate stage, neurula with dorsal neural tube closing, initial tailbud, middle tailbud, larvae just before hatch, and hatched larva. Embryos develop within the vitelline membrane. Diameter of the egg is 280 μm, and the larva is 1.5 mm long.